(a) Disconnect the fuel pipe No. 1. Remove the fuel pipe clamp. Pinch the tube connector and pull out the fuel pipe No. 1. Check the connector for dirt, mud or other contamination. Be sure to keep the tube connector, pipe and O-ring clean. They can become contaminated easily. Do not use tools when disconnecting the fuel pipe. When the pipe and the connector are stuck, push and pull the connector to release it. Then pull the connector out carefully. 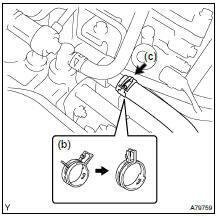 (b) Lock the hose clamp, as shown in the illustration. (c) Disconnect the heater inlet water hose. (d) Remove the nut and disconnect the ground cable. (e) Disconnect the 6 fuel injector connectors. 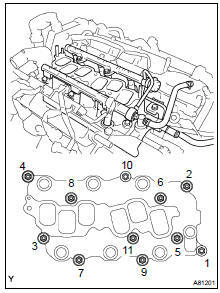 (f) Loosen and remove the intake manifold's 9 bolts and 2 nuts little by little in the numerical order shown in the illustration. (g) Remove the intake manifold. NOTICE: Fully removing each bolt and nut one by one may damage the intake manifold, bolts and nuts. 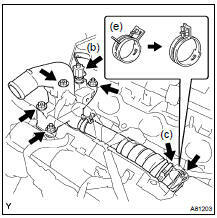 (a) Disconnect the radiator hose inlet. (b) Disconnect the ECT sensor connector. (d) Remove the 2 bolts, 2 nuts and 2 washers. (e) Lock the hose clamp as shown in the illustration. Then remove the water outlet together with the water by-pass hose No. 1. (f) Remove the 2 gaskets from the 2 cylinder heads. (a) Disconnect the 2 sensor connectors. (b) Remove the 2 nuts and 2 sensors. (a) Install the 2 sensors with the 2 nuts, as shown in the illustration. Torque: 20 NVm (199 kgfVcm, 14 ftVlbf) (b) Connect the 2 sensor connectors. (a) Install 2 new gaskets to the 2 cylinder heads. (b) Install the water outlet together with the water by-pass hose No. 1 and unlock the hose clamp. (c) Tighten the 2 bolts, 2 nuts and 2 washers. Torque: 15 NVm (153 kgfVcm, 11 ftVlbf) (d) Install the clamp. (e) Connect the ECT sensor connector. (f) Connect the radiator hose inlet. 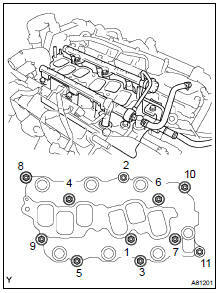 (a) Tighten the intake manifolds's 9 bolts and 2 nuts little by little in the numerical order shown in the illustration. NOTICE: In this case, fully tightening one of these bolts or nuts without partially tightening the other bolts or nuts in the group may damage the intake manifold, bolts and nuts. (b) Retighten the water outlet mounting bolts and nuts. Torque: 15 NVm (153 kgfVcm, 11 ftVlbf) (c) Install the ground cable with the nut. Torque: 8.4 NVm (86 kgfVcm, 74 in.Vlbf) (d) Connect the heater inlet water hose. (e) Connect the fuel pipe No. 1. Push the quick connector into the pipe until it makes "click" sound. Check if there is any damage or contamination on the connected part. After connecting, confirm that the connector and pipe are securely connected by trying to pull them apart. Install the fuel pipe clamp.